SquareOff provides automated Trading Bots that will automatically place trades in your own Trading Account. Trading strategies built on statistical and mathematical models have historically offered higher returns than their benchmarks and mutual funds but they are not been open to every trader. If a trader wants to subscribe for tips providers, there is always a huge gap between the stock tips sent by the advisory and the trade executed by the trader.By the time a trade is executed, the stock price would have already shot up and thus we miss a trading opportunity. Most of the tips providers are bogus and they do not have any technical trading strategies. We at SquareOff recognized these drawbacks in the Stock Market trading and decided, “there had to be a better way”, and so SquareOff was created. We will open a new trading account for you with our preferred broker, which will be mapped to our algorithm. Once new trading account is activated, you can transfer funds to your own trading account. Our algorithm will be mapped to your account, whenever algo triggers an order it will be replicated in own account automatically. No manual intervention required from your side. You can just relax and keep track of your account on daily basis. 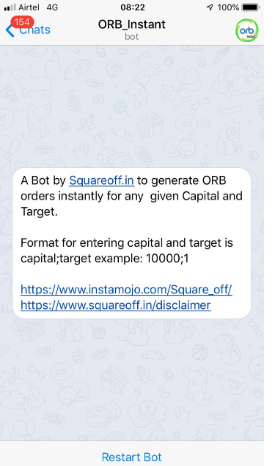 Squareoff provides automated Trading bots based on quantitative trading strategies which automatically places trades in your own Zerodha / Upstox account at a click of a button. All it takes is few seconds of your day. Once a customer has sufficient funds to invest, SquareOff proprietary algo would predict when to trade/invest in Markets. Not much manual intervention required from the customer, they can continue with the day job or business while our Algo would take care of their investments. Customers receive the benefits of Algorithm trading while maintaining control of costs, increased security, and complete transparency. Its a free Intraday 2PM range break out alert for Bank nifty. Works for Both Zerodha & Upstox users. Its a modified version of NR7 Trading strategy that focuses on false breakouts. Please fill your details, we shall contact you soon.